South Korean electronics giant Samsung, on 26 August, said it has installed solar-power operated free mobile charging facilities in the city of Bengaluru. Solar charging mobile stations have been installed in front of select Samsung smart cafes across Bengaluru, the company said in a statement. Mobile charging facility is free of cost and the time spent near the store will be utilised for product demonstrations and conversions, it added. The company said its free solar-based mobile charging facility is a "first-of-its-kind in India" and requires very less maintenance. 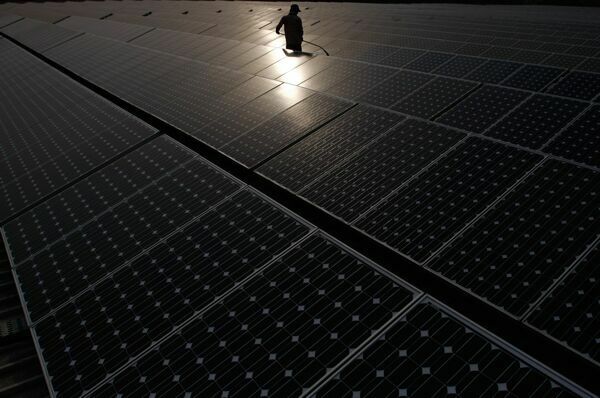 Solar power capacity of 300KW is sufficient enough to charge over 20 mobile phones daily, it added. Locations of free mobile charging facilities in the city are CMH Road, Indiranagar; Total Mall, Sarjapura Road; Sahakaranagar; Malleshwaram; and Vijaynagar. The company on Wednesday also announced the launch of Galaxy S6 Edge+ in Bengaluru. "The Galaxy S6 edge+ will be available across all retail points from August 28 in a Gold Platinum and all new Silver Titanium color at a price of Rs. 57,900," Samsung India Vice President, Marketing, IT & Mobile, Asim Warsi told reporters in Bengaluru. "The Galaxy S6 edge+ will be manufactured from our Noida facility to meet the demand of the Indian consumers... the Indian R&D team has been intricately involved in the development of various key features in the Galaxy S6 Edge+ like the 'Live Video broadcast', People Edge, Easy share, Camera and the My Profile," he added.